HomeOctober — To Be or Not to Be? October — To Be or Not to Be? Is it To Be or Not To Be??? That is definitely the question. Whether we will be able to move in on October 10th or not, only time will tell. 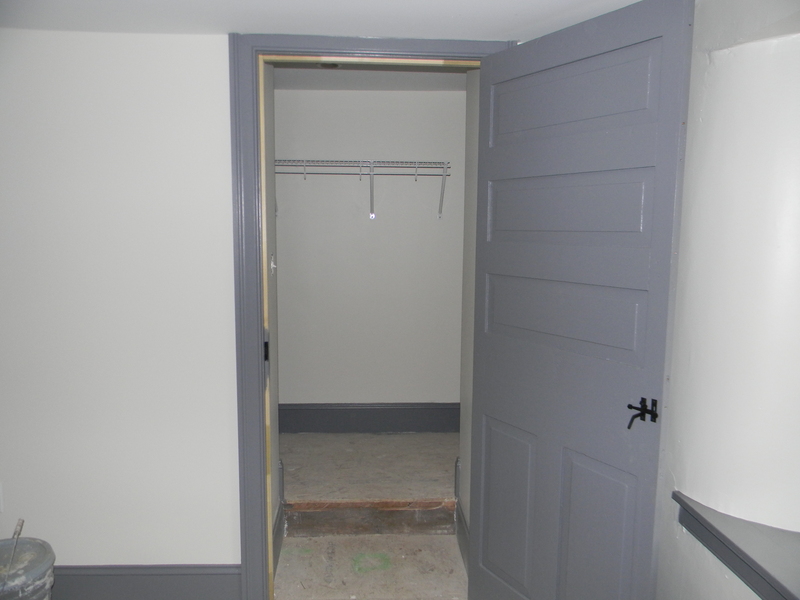 There is a lot to get done yet, but John assures us it is all doable, given no major problems – like Hurricane Joaquin, or the lack of electric, plumbing, septic, propane, heating/cooling. 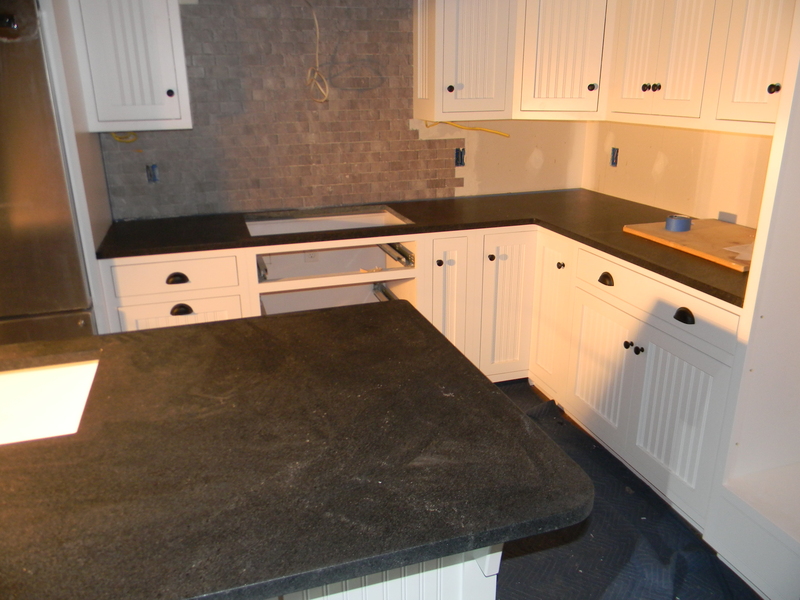 We have windows, doors, cabinets, counter tops and some appliances. The electrician is scheduled to finish up early next week, TV & Internet on Monday, HVAC, plumbing & the concrete patio on Tuesday, carpet on Wednesday, a double oven on Friday (to replace the one damaged in transit)… it’s a tight schedule of things to be completed. An orchestra of craftsmen, all trying to play their parts in harmony; no missed beats, no sour notes, no room for error. We are more than tired of our time at the Homewood Suites. It’s getting cold out, and back in early July, I only packed my warm weather things. I miss my wooly socks and turtle necks. It’s time to pack away the shorts and flip-flops. Everything is in transition, in boxes, in limbo. For three months we’ve dealt with a two-burner stove (only one burner works on a regular basis), a microwave and a toaster. We’ve been relatively creative with the meals we’ve prepared, but I want to roast a chicken, bake some bread and have Arianna decorate some cookies in the new kitchen. At the moment we still have no front steps. We can’t get front steps until we get the concrete landing, and we might not get the concrete landing if we don’t get some dry weather. 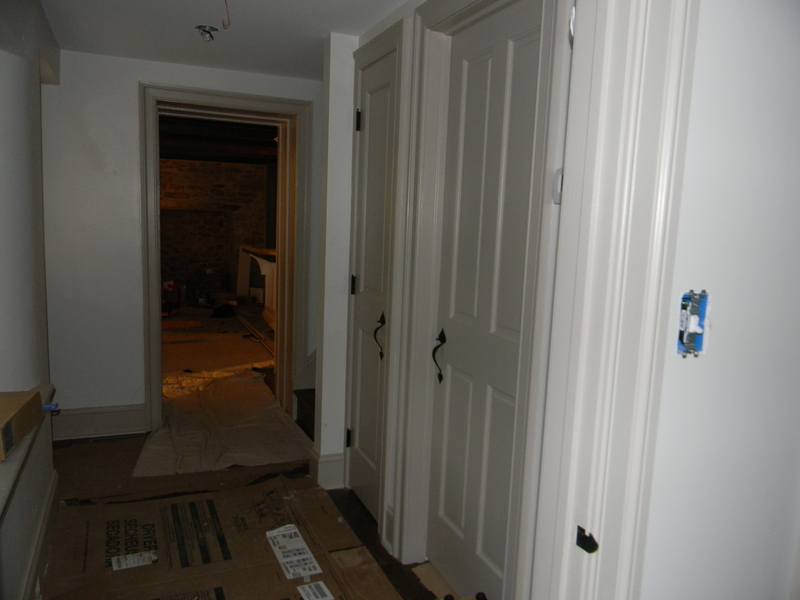 We have electrical outlets and light fixtures installed, but no electricity from the pole. They are supposed to hook us up on Tuesday, unless of course they are dealing with mass outages from Joaquin. The septic probably works, given that we have a new pump, but without plumbing and electric so we can give it a test flush or two – we just don’t know. And, moving weekend is Columbus Day weekend, which means my strong moving crew will be away. They can get a few necessities in on Friday night before they skip town (like a mattress, a TV and a couch), and help us with the rest when they get back on Monday – but in the interim we’ll just schlep boxes, one at a time, and try to unpack – maybe. Or maybe not. The kitchen — still a work in progress, but we have counter tops and the beginning of a back splash. 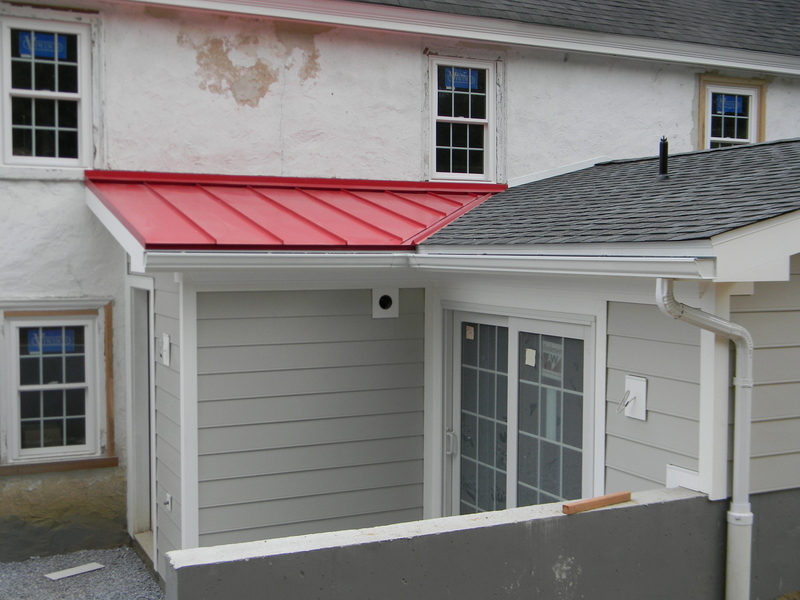 Our mud room red roof gives the look of a “potting shed” — which seems fitting given all the mud that’s readily available at the back door from storm run off. If only the weather holds out and we can get the concrete poured next week. 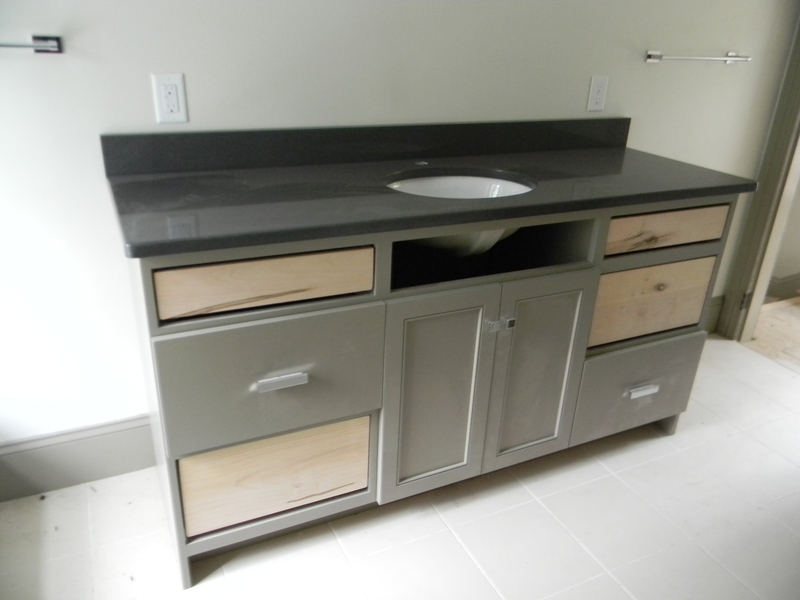 Master Bath vanity, not quite ready. Master closet has a clothes bar — we must be getting close to moving in. Still a lot of construction going on. 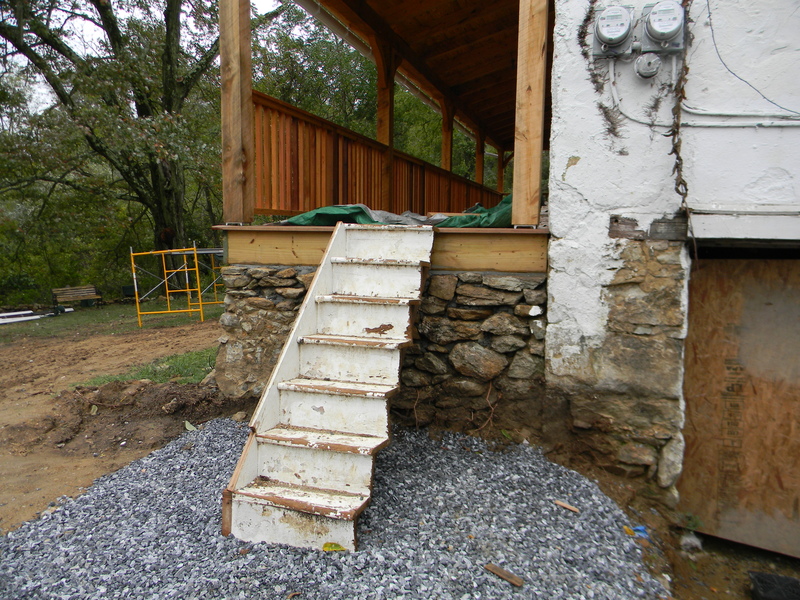 Repurposed half stairs to the porch. We need something sturdier for moving day! Wow! It’s really getting close! We’ll pray AND keep our fingers crossed that all goes well! Looks livable to me. Well, the front porch steps are a little shaky but other than that I say move in and use the fire place for everything. Pioneer style. It’s all coming together, and it’s going to be perfect! In a week you’ll be moved in. In about two weeks you’ll be unpacked and the house will be decorated. And in approximately three weeks you’ll be passing out Halloween candy from the new front porch of your new home!